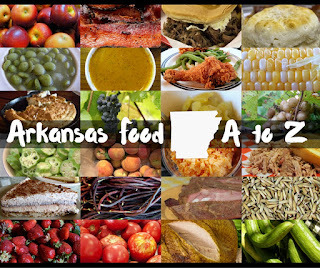 While I was up in North Central Arkansas working this past month, I made a lot of stops here and there. Most of them were spur of the moment deals or specific places to visit while on assignment. 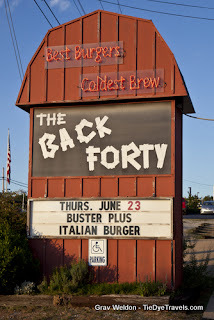 The one place I had to go, though, was The Back Forty. Facebook fans have been bugging me for months to get me up there to try the burger. So yes, I did go and have myself a Barnbuster. Only natural, right? 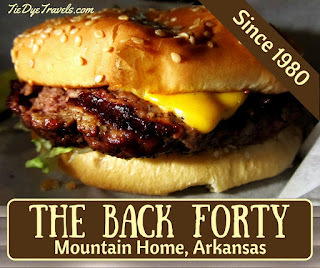 The Back Forty is a long-time establishment in Mountain Home. It’s been around since 1980. You can sorta tell it’s been added onto over time. It’s a little unusual in the fact that there’s about zero windows in the place. It’s a family restaurant that plays out like a Western saloon. I’m not knocking that. Just makes photography a little different. The kitchen is an open affair right behind the bar. 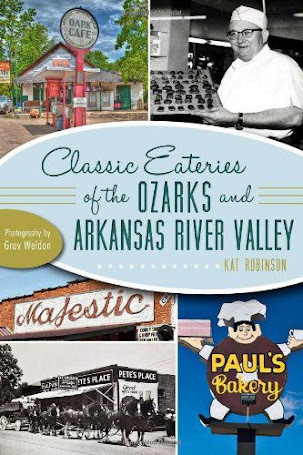 That means they’ve been cooking burgers in an open kitchen long before Wolfgang Puck decided an open kitchen was a good idea for customers to see. Back before celebrity chefs. Oh, I digress so much. 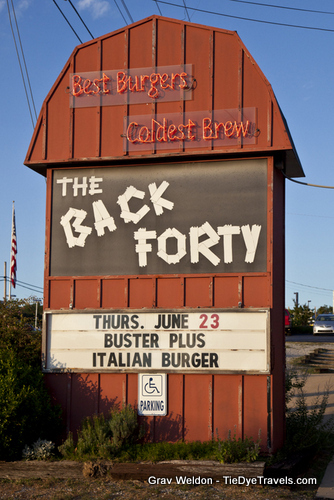 There are several items on the menu at The Back Forty. 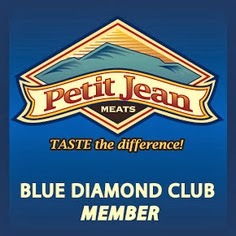 Like Ms. Piggy ($5.85) — a thin sliced grilled ham sandwich. 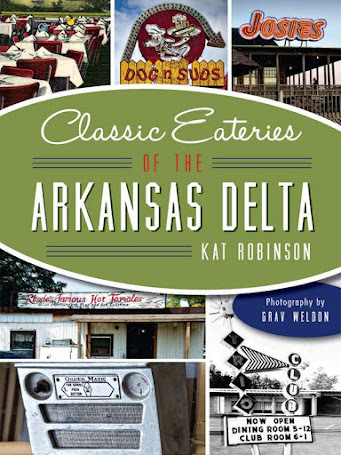 Like breaded cauliflower nuggets ($3.05) and Shrimp Jammers ($3.25) — the latter a whole shrimp stuffed into a battered and deep fried jalapeno. But you want to know about the burger. We shared a burger (we had literally just eaten at Just Deb’s, and were like to explode already) and a half order of onion rings. We were actually asked how we’d like it cooked — seeing as the burgers are ground round they can get away with that — and we asked for it medium rare. Got to see that burger cooked on the griddle right out in front of God and everyone — there’s no surprises here. Just meat sizzling’ on hot iron. Got our half order of onion rings — nicely cornmeal battered and deep fried, more than enough for us after our repast moments before. Plenty for one person on a normal day. Tasty. And the burger — they brought it out to us cut in half. I’m cool with that. It smelled phenomenal, like flame and fortune. 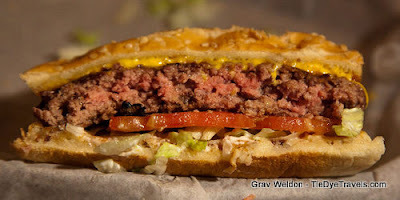 The burger was served up on a sesame seeded bun, American cheese on the top (Swiss is the other option), a half pound patty seared nearly black on the outside and still a warm reddish pink in the middle. It rested on a hefty dose of tomatoes, shredded iceberg lettuce and chopped onions atop the toasted bottom bun with a wipe of mayo to boot (ketchup was on the table). And it tasted like the Old West, somehow capturing that great outdoor flavor. The patty had been seasoned with white pepper and garlic and it was just fine in my opinion. My dining companion, who tends to lean towards saltier things, did say he thought the patty needed a bit of salt to it. I’ll give him that one. The burger runs $6.45 — another 20 cents for cheese. There is no small version of this burger. You get it, you get it. And despite having already eaten, we finished off that burger. My my, it was good. Probably one of the top 10 burgers in the state, though I reserve the right to tally that later and see where it falls. Good stuff. 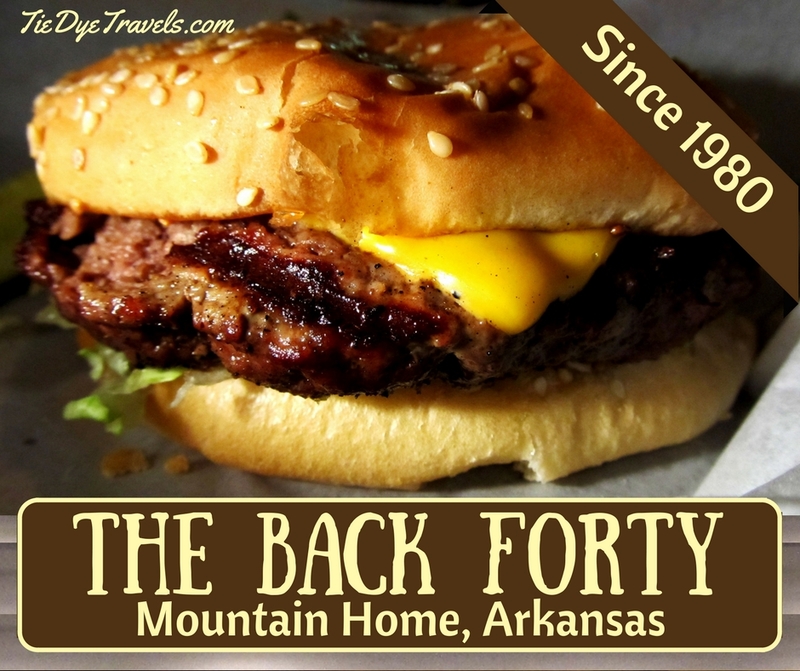 You’ll find The Back Forty at 1400 Highway 62 on the east side of Mountain Home. 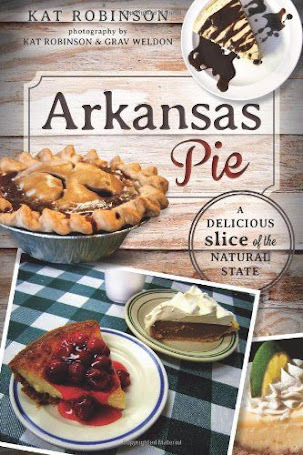 It’s open weekdays 11 a.m. to 11 p.m. (870) 425-7170.